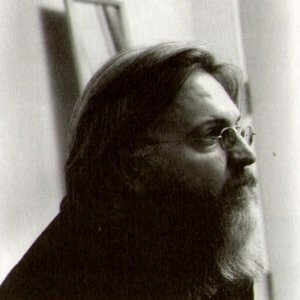 Oh, the elaborate plans I’ve had for marking the sixtieth birthday of Paddy McAloon at one stage or another. A full box set of “Swoon” on wax cylinders with a working player was one. A mysterious package containing a Gillette razor gift set and a card bearing the legend “From your friends at Boots the Chemist”. And so on. A few months ago I’d settled on the idea of an elaborately bound book containing beautifully printed testimonials from fans. But what can I say? Life gets in the way, I had a murderous travel schedule for work in the early part of the year, the logistical details didn’t quite gel, and the whole thing slid away into something to do tomorrow. It’s not quite what I want to say of course. Somehow putting what I feel about Prefab Sprout into words is impossible… What was the expression used on another site, “it’s like grabbing armfuls of fog”. It’s given me years of enjoyment and obsessive fascination, but I couldn’t tell you why exactly. There’s something in the gorgeous melodies, the way Paddy sells a song with a vocal, the little lyrical flicks and cuts that catch you off guard… and then above all the myth, the lists of songs you’ll never hear, the lost albums. Something in all of that takes you over. And it’s led me in all sorts of unexpected and completely fascinating directions, collecting, learning audio/visual restoration techniques, cut and paste video making, detective work, even translating from Japanese. You can’t say that on a card. It sounds bonkers. But it’s true. But not saying that has left plenty of room on the card, so if anyone wants to add something more (or less) prosaic, why not leave it as a comment here? Maybe best not ask for tours or concerts or albums or anything else, just write down whatever it is you feel makes Paddy’s music special to you. And in a week or two I’ll maybe try to find a way of getting the good wishes to him. You’re right about one thing, it’s not an easy one to put into words. Paddy has been there , some way of other, most of my life. I was an awkward, nerdy 15 year old who suddenly discovered a songwriter who wrote absolutely cool songs and boasted about the influences she had grown up with (Sondheim, Gershwin…) and which she thought were too uncool for pop music. And he was cute, articulate and well read into the bargain. Of course, he became my idol. What I didn’t expect was that the fascination would stay there…for 30 years. Not all the time of course- life gets in the way and stuff, but he was there at the right moments. His music, his songs, his myth, his not selling himself and doing exactly what everybody would advise him against: from not touring to growing a biblical beard. And all the time, gentle and respectful and nice to pestering fans, myself included. Without really knowing, he has helped me a lot in many moments of my life and hopefully will continue to do so… His appearance last March in YouTube was another example. In a hopeless time like this is, to hear him sing about love, respect, and common sense was like fresh air. Thank you Paddy. So much. For everything. Enjoy your 60s with the ones you love. 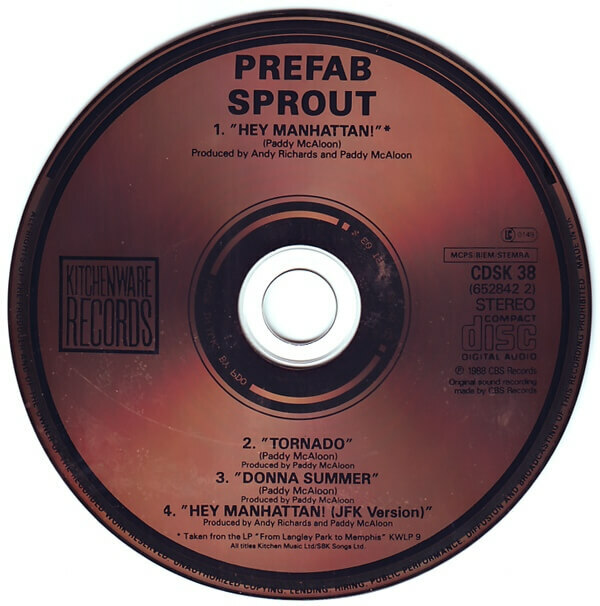 The music of Prefab Sprout has brought joy and calm into my life for over 30 years, and I want to thank you dearly and sincerely. There’s something about your music I have never found anywhere else, and it often soothes right where the pain is. Thank you and bonne-fete from Montreal. Beautifully written, Tim. Love the observation about “lyrical flicks and cuts”. I discovered his work in the mid-80s while studying at Oxford — a lonely Canadian who’d just been dumped by his dream girl from Liverpool. I can honestly say that Paddy’s voice and those wonderfully cutting yet empathetic lyrics on Steve McQueen kept me buoyant when I easily could have drowned. Happy birthday to the Man. From one outlaw to another. Happy birthday Paddy. From the moment my friend played me ‘Swoon’ just after it was released, and I heard ‘Cruel’ I was hooked, and have been ever since. I saw the band in Glasgow on the Jordan tour and it was one of the greatest nights of my life, but the records are the gifts that keep on giving. Thank you for everything, sincerely, and please keep on doing what you do so very, very well. Tonight let’s raise a glass, my friends: To the best jewel thief in the world. 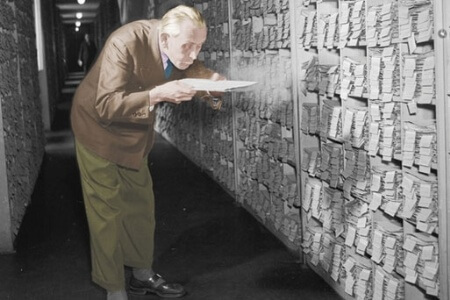 To the Fred Astaire of words. To the last of the great romantics. To Paddy McAloon, the bard of County Durham. If music is a princess, you’re the king of rock’n’roll. Words, music and everything: your plans are ambitious, a blueprint of wishes – a grandeur that won’t be controlled. Every line is evidence: to catch the world in images. Grander than castles, cathedrals or stars, some things hurt more than girls and cars. While words are trains for moving past what really has no name, any music worth its salt is good for dancing. And the most eloquent way to speak or to pray is straight from the heart. Pounding out messages loud on the drum. Just because you can. Meanwhile there is a real world, but you are living in a lullaby. Now they call you a recluse, been in the desert so long – you’ve grown a long and silver beard. And although duty may not track you down, you’re only as good as the last great thing you did. All those insights from retrospect, there in the cards there in the tarot. Trust what you cannot know. Living is your song, indeed your voice. As the mythic fog descends, you remain mysterious to the last. Ride with stateless kings, and spread your golden wings. Watch your legend grow, as we’re basking in the glow. And thank you for the sounds and words in sweet communion – echoes of a better world. In the coming year (and many more), may you have the vitality to be productive in the endeavors you choose, and may those days bring frequent joy and pervasive satisfaction. With multiple crises the past few years, i’ve found i haven’t needed any tool or device, my mind has played your music perfectly to soothe and comfort me over and over. Of the many genres i enjoy and the thorough examinations of my favorite artists’ catalogs during my life, i can honestly say i’ve never had a more profound response to an album than Two Wheels Good in the autumn of ’85. Thank you for sharing your gifts with us. It’s been an honor to be contemporary to your career and look forward to each release. Love to you and the Mrs. and Misses McAloons. Congratulations to 60 years Paddy! 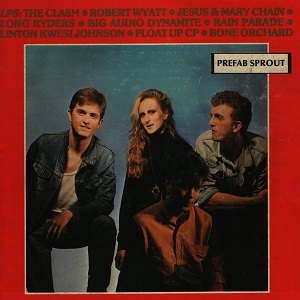 Prefab Sprout has inspired me in every possible way since 1984, unbeatable No. 1 for over 30 years. Thank you for sharing your music and interesting lyrics with the world. Many happy returns, Paddy! Best wishes from Germany – your music means so much too me and it certainly stood the test of time! Whenever there was love, making me feel good or bad, Paddy had the right soundtrack to warmly rain down on me. What a beautiful mind! 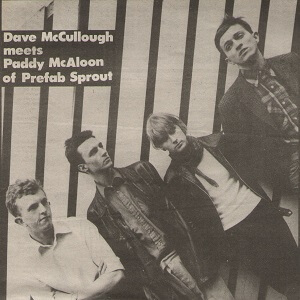 I’ve got every album Prefab Sprout & Paddy have ever made. Can’t say that about any other artist or band. Loved music since the early 70s – all types of music – got hundreds of albums, but none of them have been played half as much as Steve McQueen and From Langley Park To Memphis. Melody maker, lyrical conjuror & maestro of sound. I’m really looking forward to the next sixty years, just think of what you’ll be able to craft when you really get the hang of this song writing lark. I tried that last time I saw him in Newcastle. Felt like an idiot. Felt that he must have head it time and time again. And again.Until it had lost all sincerity. But I meant it and after my cheeks flushed in awkward embarrassment, I left Waterstone’s elated. I wrote something about this in the early days of the site – it’s never a good thing to meet your heroes. It’s asymmetrical, it’s a big deal for you and commonplace for them. There’s an oft repeated in interview anecdote of Paddy’s about meeting Jimmy Webb and seeing a dullness cross his eyes as he asks about where he was when he wrote “Wichita Lineman”, which made him regret asking a question that had probably been asked a thousand times already. You should always keep the meeting in the realm of the possible but unrealised. On the other hand, were I ever to bump into Paddy, I have two things I’d like to discuss. Firstly: what are the words to the first verse of “Tin Can Pot”. And secondly, could he be commissioned to do a musical version of Blake’s Book of Job, because basically it’s his life story. McAloon,McCartney,Wilson. Happy Birthday to one of the greatest living songwriters. Love and respect, Huw. Ciao Paddy. Tanti Auguri e Buona vita!